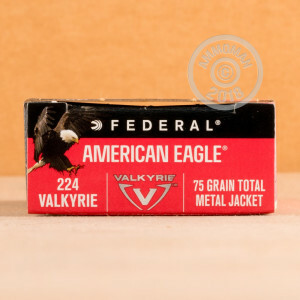 This 224 Valkyrie cartridge from Federal’s American Eagle line of ammunition sports a 75 grain projectile. The bullet’s total metal jacket envelopes even its base, so it will prevent hot propellant gasses from evaporating the lead in the core as you fire. This is a great feature for high volume shooters who’d rather breathe in as little lead fumes as they’re able, as well as use in indoor ranges where ventilation might be suspect. The bullet’s jacket further prevents the rapid accumulation of lead residue in a rifle’s bore, facilitates smooth feeding, and ensures that your shot will penetrate several types of target. American Eagle ammo may be cost-effective, but it doesn’t do away with great quality as a trade off. 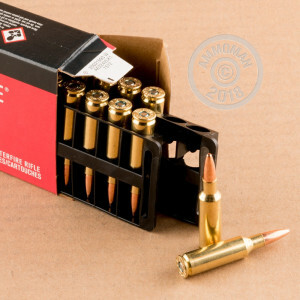 These rounds’ consistent brass casings, non-corrosive primers, and clean burning propellant are all certain to deliver great value to your next shooting session. Go and enjoy this new caliber’s flat trajectory and extraordinary range for a price that won’t make you sour!